Victory means earning experience points to level up and earn new cards, and if you complete daily quests, you earn gold coins which you can use to buy expert packs which are a number of rare and ordinary cards. Disenchanting specific cards produces arcane dust which you can use to craft rare cards. The game is incredibly deep and well balanced, with a staggering collection of cards that you can mix and match according to your preferred strategy. No hero is superior over the other; it is really a matter of how you deal with the hand you’re dealt. On another note, the cards in your deck are given to you at random, hence no two games are ever alike. 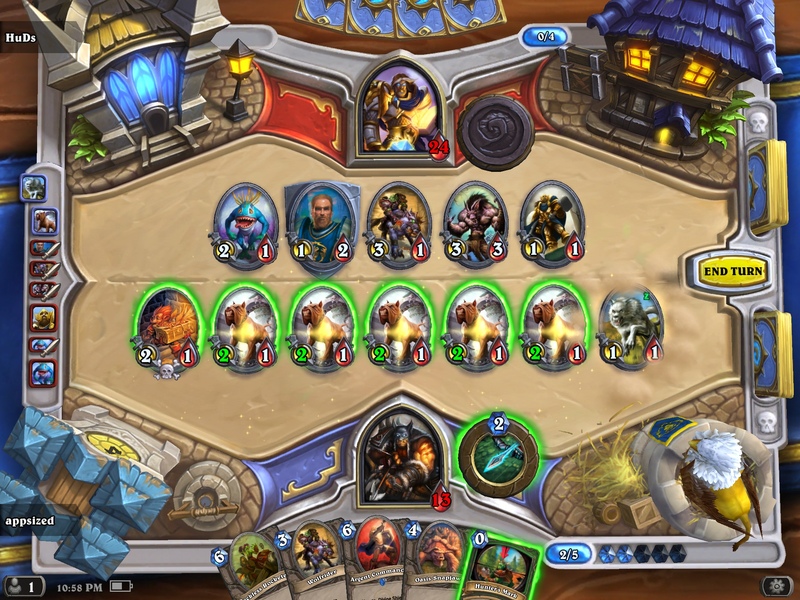 Some games you’ll win because of a well balanced deck; others you lose because the mana cost might be too high or your strategies rely on spells and minions that haven’t arrived. The attention to detail is likewise astonishing, with each card beautifull drawn and designed. While waiting for your turn, you can even interact with your environment, which is a nice way to keep things interesting and shows how carefully the developers pay attention to these little things. You can also tap on your hero to ’emote’ or say things to your opponent, ranging from mild greetings to fierce threats. It would be nice to have additional ’emotes’, say, to explain if the connection is bad, to accept an apology from another player, etc. The online system is nearly flawless, with disconnected games more due to one’s own slow internet connection more than anything else. You can add and challenge friends via Battlenet, send messages, etc. 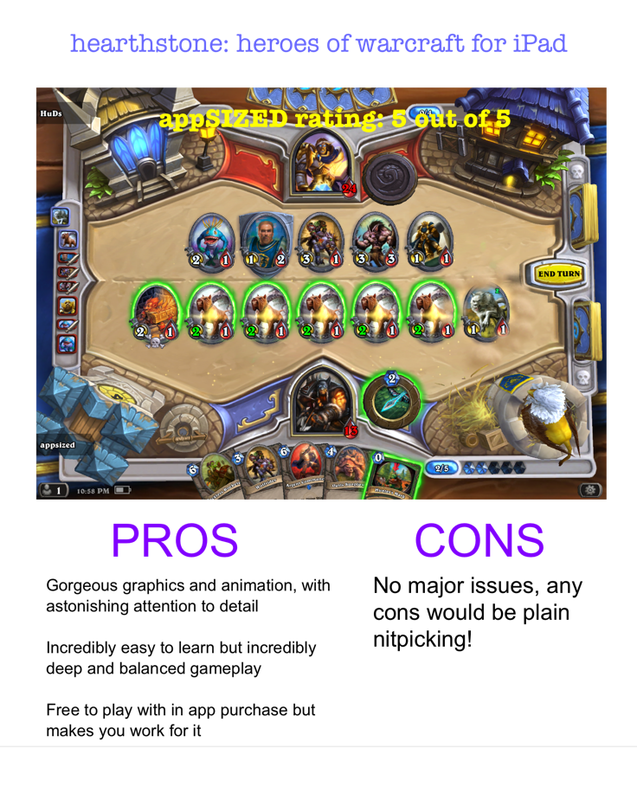 Hearthstone is also the perfect example of a free to play game. It’s admirable that Blizzard designed the game to be enjoyed by working hard to earn cards and points without necessarily having to shell out real world cash. While in-app purchase (IAP) exists for buying expert packs, you can earn these just as easily by completing quests and participating in the arena. There are no shortcuts to leveling up, there is infinite variety in how you play the game and how you can win it. 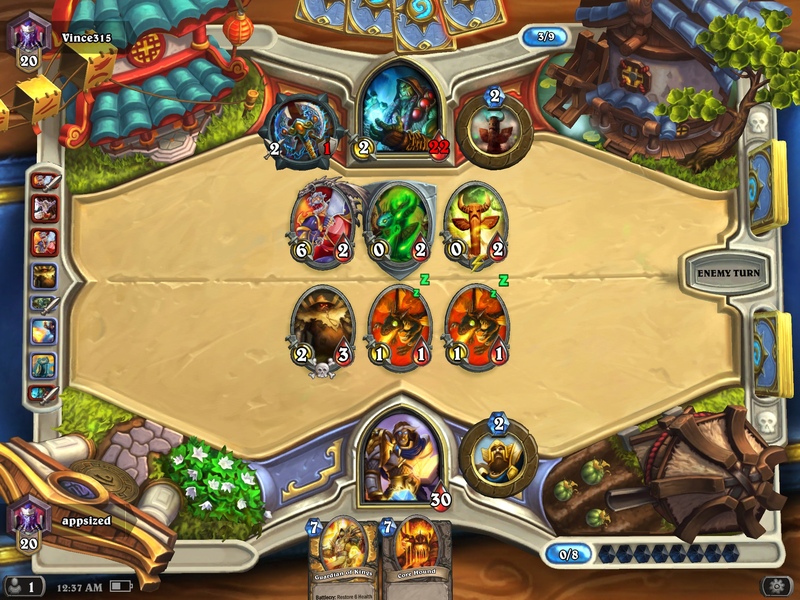 Hearthstone, without a doubt, is one of my all-time favorite games and one I envision myself playing for a very long time. It’s a virtually flawless, insanely addictive work of art, and easily one of the, if not the best game of the year.